Ringo Chiu, ZUMAPRESS.com/AlamyScott Painter, CEO of TrueCar.com. WASHINGTON -- It used to be that people in the market for a new car could go to the car-shopping website TrueCar.com, which collects bids from auto dealerships, and get dealers to undercut one another on price. Dealers could see the rival prices, so prices tumbled lower over time almost like a reverse-auction. Faced with complaints from dealers over the way that worked, TrueCar.com changed its website, the system became less competitive, with dealers no longer seeing rival prices, and now U.S. antitrust enforcers are trying to unravel what happened. The Federal Trade Commission is investigating whether car dealers across the United States ganged up against TrueCar, agreeing among themselves not to do business with the California-based Internet company because it was driving down prices, said people who have received letters from the FTC including TrueCar chief executive Scott Painter. TrueCar and dealers are now on good terms, but the FTC is investigating whether potentially higher prices from the company's changes were the result of fair market pressure or illegal collusion. The probe was disclosed in the auto trade press in September. The investigation, which appears to be in an early stage, centers on an industry that is also feeling disruptive pressure from direct-to-consumer car-maker Tesla Motors (TSLA) and on a company, TrueCar, that once had ambitions to make dealership staffs obsolete but which has since abandoned that idea. Founded in 2005, privately held TrueCar provides price data to consumers for free and assists car-buying services like the one available to American Express (AXP) members. It doesn't sell cars, but it projects that consumers will buy 400,000 vehicles this year with its help, up from 223,000 in 2012. On Thursday, the company said it was getting a fresh $30 million injection from an investing arm of Microsoft (MSFT) co-founder Paul Allen. TrueCar is also a frequent source of sales data generally, quoted by news media including Reuters. "We see all transactions across the U.S., both new and used," Painter said in an interview. The data allows the company to see, for example, how far people in a particular ZIP Code are willing to travel to buy a car, and what cars have sold for recently. In earlier media interviews, Painter imagined a future in which customers would get a guaranteed low price online and then pick up a new car from a dealer without needing to talk to sales staff, let alone negotiate with them. As the company gained momentum in 2011, a feature of its website began to get particular attention among dealers. %VIRTUAL-article-sponsoredlinks%They were allowed to see the bids that other dealers offered customers, and some dealers began to undercut prices so much they were willing to lose money on individual sales, hoping to make it back through service and repair work or future sales. Adding to dealers' losses, they agreed to pay TrueCar $299 per sale on new cars and $399 per sale on used cars. Complaints started showing up on online discussion boards. Jim Ziegler, a consultant to dealers who also writes columns about the industry, was the self-described catalyst. "Are we so bad at what we do that we have to line up and pay vendors to lose money? And, who is giving these people access to your data that is used against you?" Ziegler wrote in a November 2011 column posted on several websites. He advised dealers to cancel their affiliations with TrueCar. Many did. TrueCar said its network fell from 5,700 dealers at the end of 2011 to 3,100 two months later. Attacks came from other directions, too. These included accusations that TrueCar violated state franchise laws and had too much access to dealer-generated data. Because dealers are the source of TrueCar's revenue, it also started to bleed money -- losing $9 million in January 2012 alone. "They wanted us to die, go away," Painter said. Taken off guard, TrueCar decided to make changes, among them the disabling of the feature that allowed dealers to see what rivals were bidding for potential customers. Dealers now see a customer's name, phone number, email address and what kind of car they are interested in buying. Customers see prices from area dealers. The company defends its new system, saying it wouldn't have been able to survive if it hadn't changed. "In order for an auction to theoretically work, you have to have willing participants. And we live in a free country, right?" Painter said. "If the outcome of a pure reverse-auction is unsustainably low prices that drive dealers out of business, that doesn't really work." Besides, he said, price is only one factor for car-buyers and is often less important than location and giving them the exact car they want. TrueCar began to court dealers back, telling them they were the company's customers as much as consumers were. "We are not in the business of speculating on the business model of how cars are sold at the dealer level," Painter told Reuters this month. "That's up to them. Our job is to help dealers and consumers find each other and have the information to make a good match." 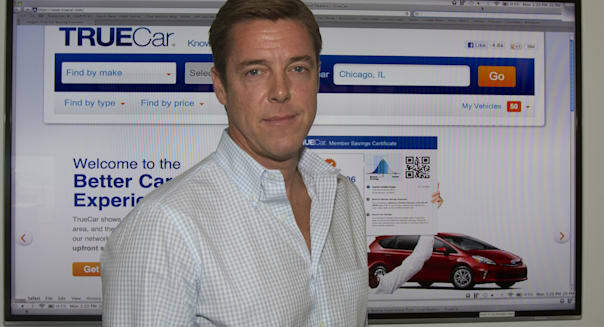 TrueCar's network has rebounded to 6,700 dealers, an all-time high, and the company is now a "genuine participant in the automotive ecosystem," Painter said. As for what happened to prices after the turnaround, TrueCar does not have data on that, a spokeswoman said. One dealer, though, estimated that prices have risen to the point where he is making 30 percent more profit than he was at the height of TrueCar-induced competition when he saw rivals' prices and cut his accordingly. "My prices are higher today than they were at the beginning of TrueCar," said Earl Stewart, who runs a Toyota dealership near West Palm Beach, Fla. "It's still a good buy for the consumer, but it's not as good as it was at the beginning." Stewart, a member of TrueCar's Dealer Council, defends the company as embodying the free market. Other dealers urged him to stop using it in the earlier, more competitive period, he said. "I had dealers call me and say, 'Let's stop this madness. Let's keep our prices at a reasonable level.' I said, 'You can't talk to me about that. You're going to go to jail. That's an antitrust violation,'" Stewart said. Consumers can shop around as they always could if they want to put in the legwork to show quotes to other dealers. It isn't clear how the episode came to the attention of antitrust enforcers, but in September, dealers received letters from the FTC asking them to preserve documents. The FTC said it was looking into whether some companies violated antitrust laws "by agreeing to refuse to deal with TrueCar" in 2011 and 2012, according to Automotive News, a trade publication that got a copy of one letter. Ziegler, the industry columnist, got a letter from the FTC, too. In an interview, he said he would cooperate but that the FTC was ridiculous for starting a probe so long after TrueCar and the dealers had resolved their differences. "If they had done this when it was a hot issue, it would make a lot more sense," he said. Even now, he added, the investigation is unwarranted because dealers did not collude. He said they cut ties out of their own self-interest to stay in business. "I know a lot of dealers canceled them, but it was all individual decisions," he said. It was unclear how many dealers have received letters from the FTC. The National Automobile Dealers Association, a trade group, said it received one and is cooperating but does not believe it is a target. Investigations into concerted action are often straightforward, said Seth Bloom, a former Justice Department antitrust lawyer now in private practice in Washington, D.C. "If they can find an agreement among competitors not to deal with this distribution channel, it's basically a case right there," he said. If the FTC were to find that there was anti-competitive behavior, it could order TrueCar to restore its former business practices or search for other remedies, Bloom said. Painter expressed ambivalence about the FTC's investigation. He said TrueCar did not request it, is not a target and is paying fees to two law firms, Alston & Bird and Wilson Sonsini Goodrich & Rosati, to comply with it. He said he had no opinion on whether the dealers violated laws meant to protect competition. "If it's determined that there was a perpetrator and a victim, we're the victim," he said, "but I think that we as a company have already survived this issue, so I don't know what you could do to help the victim." With TrueCar having changed, he added, "dealers are back on the program, so we have no interest in picking any fights."